It’s National Dog Day – Do you know your Harry Potter dogs? In honor of Rowling’s latest release and National Dog Day, let’s see how many dogs of the Wizarding World YOU can name. A pair of adorable pups probably come to mind right away: Fang and Fluffy. Fang is described as a Boarhound, but that is actually another name for a Great Dane, so yes indeedy, Fang is a giant, black Great Dane. I imagine him like the tallest Great Dane in the world, George, who was 7’3” long from his rubbery nose to the end of his ouch-my-face-is-not-a-windshield tail. Sadly, George passed away in 2013, but he will forever live on in the scratches he left at the top of his family’s refrigerator. It doesn’t seem fair, but large dogs do not live as long as smaller ones. I hate to think how many raw steaks Hagrid will need to hold over his swollen eyes when Fang must leave him. 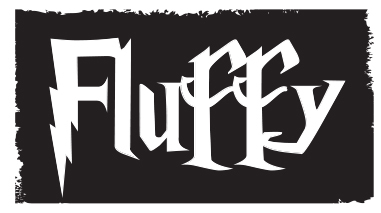 Fluffy is the large, vicious, three-headed dog that guarded the Philosopher’s Stone and could only be tamed through music. I love the idea of a three-headed dog. You get three times the adorable, loving stares and only one part of the . . . you know. In The Philosopher’s Stone, Hagrid explains that he got Fluffy from “a Greek chappie.” Rowling is showing off her impressive knowledge of ancient myths and legends with this off-hand remark, as Greek mythology is replete with three–headed canines, also known as hellhounds. The most famous of the pack, Cerberus, guarded the entrance to the Underworld. 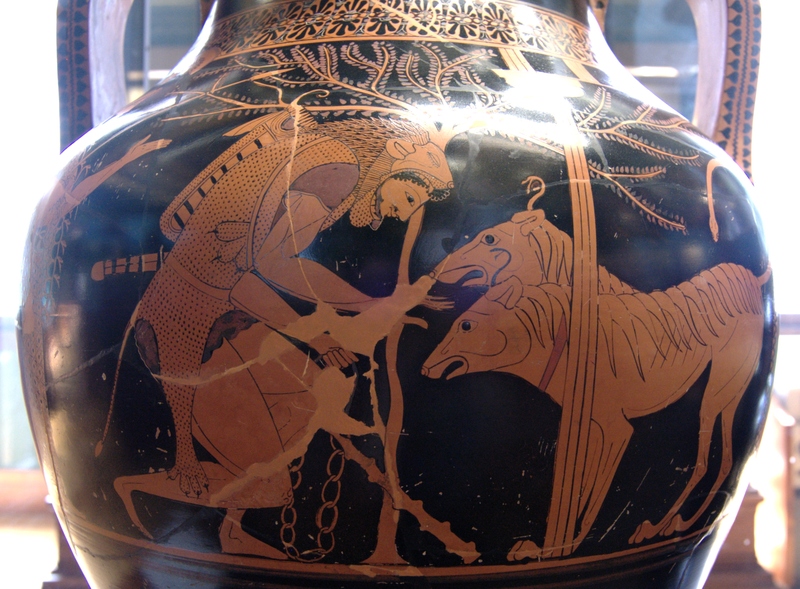 A Greek amphora from 500 BC showing us Hercules taming a two-headed Cerberus, (apparently by singing to him since I don’t see an instrument). I’m not sure what happened to head number three, but I guess you can afford to lose your head when you’ve got a couple of spares. Remember him? Maybe not, because despite his impressive name, he is a decidedly non-magical creature. 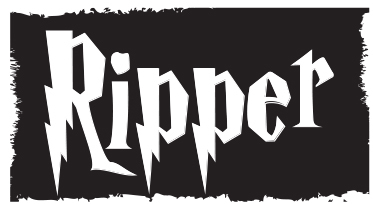 Ripper is the favorite of Harry’s Aunt Marge’s twelve bulldogs. 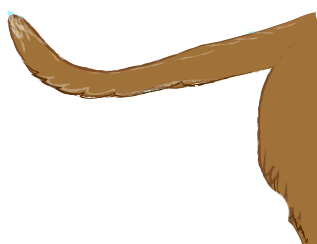 He once chased Harry into a tree, which wasn’t very nice, but he also sunk his teeth into Vernon’s leg, so there’s that. What? You didn’t think of Crups? That’s okay, they only get one quick mention in The Order of the Phoenix, as creatures studied in Hagrid’s Care of Magical Creatures class. Crups are wizard-bred dogs that look like Jack Russell terriers, except that they have forked tails. Popular singer Celestine Warbeck is known to be a breeder of Crups. 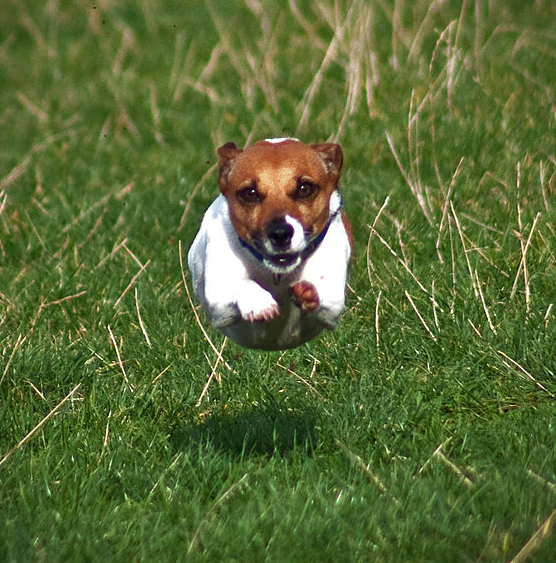 The Jack Russell in this picture may or may not have a forked tail, but he sure looks magical! 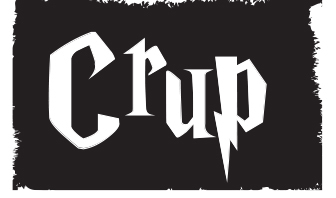 Accio Crup!! That’s right, Ron’s Patronus, his alter-self, is a dog—a loyal if not altogether bright creature. The choice of a Jack Russell for Ron was a sentimental one, because Rowling once had one for a pet. Going with the red hair theme, I would have picked an Irish Setter, but that was probably too obvious. So obvious, in fact, that my patronus is probably a dog . . . The Grim is the omen of death in the form of a giant, shaggy black dog that Harry didn’t actually see. Oh, he did see a dog, but it didn’t turn out to be the Grim, and Harry did not die. Several dogs could be the source of Rowling’s Grim, including the Black Shuck of English folklore and the Cu Sith of Scottish mythology, both of which signal death. There’s also the Church Grim of Scandinavian and English folklore, a guardian spirit that guards churchyards after being buried alive there for that purpose. Shudder. 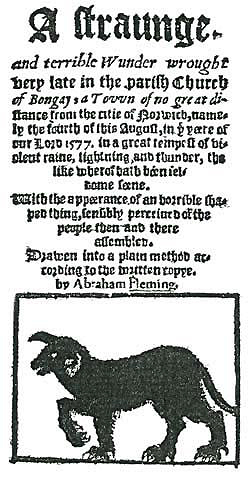 A description of the appearance of the Black Shuck at a church in Suffolk, England in 1577 starts with: A Straunge and Terrible Wunder wrought very late…. It’s no surprise that dogs sniff their way into Rowling’s books; if humans cannot live without the furry, tail wagging wonderfulness that is dogs, why would wizards want to do so? Only problem is, Dinky, the Great Dane in my middle grade book series, can’t stop drooling over the fact that Fang is also a Dane. 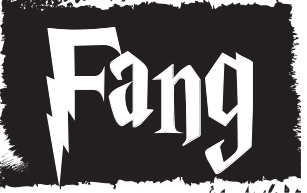 Suddenly he is a Fang Fandog! Down Dinky, down! Yes, I will get you a Fang poster for your doghouse, but in the meantime, my face is not a windshield! Ow! What are the titles of your works, and can you tell us a bit about them? “Excelsior” is a young adult / science-fiction novel, the first part of a trilogy. It tells the story of 17-year-old Matthew Peters, who has been spending seven years writing and drawing his own webcomic about a character named Excelsior, who is from the faraway planet Denab IV. Matthew is visited by an older woman who tells him that she is from planet Denab IV, and everything he has been writing and drawing have actually taken place. So now, with Excelsior’s enemies growing in power on both Denab IV and Earth, Matthew realizes that he has the opportunity to become the hero that he thought only existed in his imagination. “From Parts Unknown” is a five-part science-fiction / sports serial that is currently available on eBook as one complete file. The main character is Stephen Barker, a man who is trying to provide a living for his family by getting on the roster of the only sport left in America: the GCL (Gladiatorial Combat League). The company is a combination of the over-the-top characters & good guys vs bad guys storyline of professional wrestling and the reality of boxing & mixed martial arts. Stephen unknowingly becomes a pawn in a behind-the-scenes battle of control over the league between the current champion and the top villain in the company, and is turned into a monster of a man stripped of his identity and humanity. While his wife tries to find him, she discovers that the GCL is not only providing entertainment for the masses, but it is also used as a tool of distraction and stripping of people’s rights by the US Government. The first of two “Excelsior” sequels – “Ever Upward: Part Two of The Excelsior Journey” – is currently being edited and prepped for a November 2016 release. 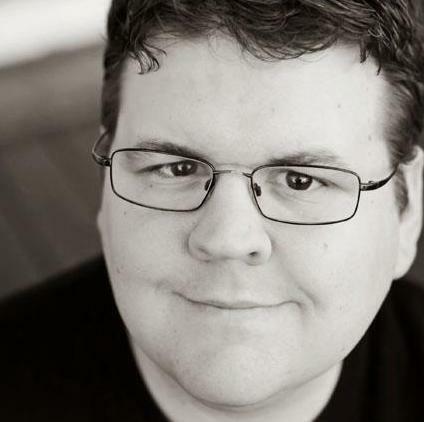 It’s easy for me to say Matthew Peters is my current favorite, since I put so much of myself and my late cousin Matthew Peter Henkel into him. He’s the ultimate in wish fulfillment, getting to be a hero that he thought was just his idea. But looking at all the completely fictional characters, I’d have to say my favorite is General Hodera, a truly ruthless woman who is in the top ranks of the Krunation Empire. While my main character has been sitting in my head for a very long time, Hodera came to be during the rewrites of the original novel. I had a big, tall, force-of-nature like being that would really strike fear into the hearts of the Denarian people, modeled after The Undertaker in WWE. When I told my editor about him, she asked, “Can it be a woman?” Best. Suggestion. Ever. When I took the character and reworked him into a her, she leapt to life and became a truly delicious villain. I loved her almost from the beginning, and I got to use a lot of space in “Ever Upward” to further explore her character. I can’t wait to show you what she’s really made of. In your book, “Excelsior,” Matthew is a comic book writer and illustrator before he discovers the world behind what he thought he was creating – how did you come up with such a unique storyline? It really goes back to 1992. When I was in grade school (1985, to be exact), I created some characters with my friends based on everything we grew up watching: Star Wars, Transformers, G.I.Joe, Voltron, etc. We were just killing time between assignments in school, and when I lost contact with them, I kept picking at them. I knew there was something there, but I didn’t know what. Anyway, in 1992, I was in between my sophomore and junior year in high school, my grades were less than stellar, and I was in summer school taking English over again. It wound up being a blessing in disguise, because one of the things we did in this class was watch the 1981 movie Excalibur, which is all about King Arthur. At that time, I was thinking about coming up with a new character, and after seeing this, I knew I wanted him to be a legend within my little universe, a god made into a man, striking down his enemies with his sword. I took elements from Arthur, Jesus Christ, and Optimus Prime and he just came to life. The original story of Excelsior was all about the character being reborn through someone on Earth, and back then it was an adult who was a comic book writer. When I decided to start writing the novel in 2008 that would be the definitive take on him, I realized itha hads started his own webcomic, so I borrowed that element from him and named Matthew’s uncle after him as a thank you. Have you always loved comics and superheroes? If so, which one is your favorite? I’ve always loved both comics and superheroes, more comic book films than comics themselves. The characters grabbed me from the start, and I still love them to this day. It’s almost cliché to say Batman is my favorite, but there really is something special about him that has allowed him to endure in so many different forms. I’ve also been a fan of Transformers, ever since I heard that they were getting a Marvel comic mini-series and animated series on Sunday mornings. Optimus Prime very quickly became a personal hero of mine, and he always will be. Matthew gets thrown into a new world pretty quickly, yet is quick to adapt and strong throughout. What are the keys to writing a character like this? Kind of. When the barebones elements of Excelsior’s trilogy came together during my high school years, the first two parts were more or less how they wind up in these finished drafts but the third part was different, more than a bit darker. But after I discussed it with my editor, she convinced me to steer it in a different direction, and now I’m confident that the third part is going to wrap up Matthew Peters’ story in a very satisfying way. I’ve been a huge fan of William Goldman’s writing ever since I saw The Princess Bride, and I went on to get his “Adventures in the Screen Trade” books that gave me the confidence in my own voice. And I wanted to be a storyteller of any kind when I saw the original Star Wars. That really got me into my love of science-fiction / space fantasy. Sometimes, but more often, it’s – as Kevin Smith once called it – “writer’s laze.” If I’m not in front of my monitor hacking away at my work-in-progress, I lose the momentum and find myself either on social media or in front of the television in the middle of the latest Netflix marathon. Thankfully, I know now what gets my momentum up and running again, and that’s a deadline. I asked my publisher to let me know when they would like to launch “Ever Upward,” and once I got that, it suddenly became a little easier to sit down and edit one chapter after another. I’ve done both. When I did the first draft of “Excelsior” in 2008, I knew the beginning and I knew the end. That was it. It was up to me to figure out what happened between Point A and Point B. The outline for “From Parts Unknown” wound up being the original novel that I published through iUniverse in 2002. I was under the impression that I was just going to punch up that one, update the technology, and incorporate a subplot I had been thinking about ever since I got the rights back from the publisher. But as plans will do, that plan went awry in the best way possible because only scraps of the 2002 novel remained, and it went from a 234-page novel to a 550-page serial. Before I started writing “Ever Upward,” I wrote an extensive outline and worked on it with my editor. That helped out a lot and became a map for me as I went through all the different twists and turns with this story. I think with the third one, I’m going to do another outline, but I want to see if I can make it not as detailed as the second, so there’s more room for me to embellish when I get to actually write it. Do you ever get sad when you realize that the characters that you’ve created aren’t real? Not really. I’ve taken enough elements from my life that my characters have some form of reality attached to them. Matthew Peters feels real to me because of how he’s an amalgam of myself and my cousin, and I’m grateful to the one to take him on the adventure he’s on now, since it keeps my cousin’s name alive. And Excelsior has been with me for almost 25 years, so I can’t imagine my life without him. The original versions of both “From Parts Unknown” and “Excelsior” were each different challenges. “From Parts Unknown” was finished in July 2002 BK (Before Kindle), and self-publishing was still looked at as the “last option” for writers. I sent it to an agent acquaintance, and he suggested I self-publish since it catered to a very niche market. That September, I came across iUniverse and they offered a setup package of just $199, which included a free hardcover upgrade. I took a shot, the book was launched in November, and it literally came and went without much of a whimper because I had no idea how to market myself or my book. Infinity Publishing, everyone’s copies, and mailing of copies to everyone out-of-state. It took a while for that money to come in, so it was a stressful time while I was working on my edits, but it felt great getting it self-published without having to pay a dime. If I knew what “From Parts Unknown” would go on to be, I would have just shelved the 2002 novel without releasing it at all. “Ever Upward: Part Two of The Excelsior Journey” picks up six months after “Excelsior” (in Denab IV time, so SHOULD BE five years in Earth time). I gave myself three commandments for this one: I wanted it to be longer (the first book is less than 80,000 words and this one is between 110,000 & 115,000 words), I wanted it to go deeper into Excelsior’s mythology, and I wanted it to be darker. All three are definitely accomplished. We’re going to take a much bigger look at Denab IV itself, we’re going to go inside the hierarchy of the Krunation Empire, General Hodera will be given a much bigger role, we’re going back to Earth to catch up with Matthew’s uncle Jason, a major character from the original will come back to life, there will be a major battle on the 70th floor of Rockefeller Center in New York City (with cameos by former Top of the Rock colleagues), and we will not only see the complete origin of Excelsior himself, but also that of his greatest enemy. I’ve had people say that “Excelsior” is clichéd, which makes me want to say, “Of course it is, it’s my take on Campbell’s “Hero’s Journey,” so that doesn’t really bother me too much. The toughest critique I’ve gotten is that it’s under-written, and I understand the way of thinking behind it and I won’t fault them for saying it. I’ve always been story-driven, and I just want to get on with telling the story when I feel I’ve given enough description. Do not – I repeat, DO NOT – be afraid to write a crappy first draft. Get it on the page, get the story out, and commit to going back and fixing what you have. Almost every bit of writing comes from rewriting, and you can’t rewrite from nothing. Thank you George for sharing a bit of yourself and your books with us. Miss last week’s post? Check it out here! In need of a new and exciting read? New Releases! Are you a teenager or know a few who love to write? Our Flash fiction contest is now open. Find out how to enter to win some great prizes. Contest details. Today I’m comparing two books that, at first glance, might appear to have nothing in common. And I’m going to try to do it without spoilers…we’ll see how it goes. As I wrote in an earlier post, I believe YA dystopian literature can serve as a bridge to the classics in the genre. Introducing young teen readers to books with social commentary in a YA setting better prepares them to accept and appreciate adult novels with similar themes. Both Fahrenheit 451 and Matched illustrate how societal organization can easily become oppressive and regimented, and both focus on the evils of censorship. Guy Montag, the protagonist in Fahrenheit 451, has been a fireman for ten years. 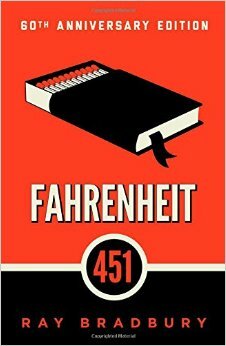 Firemen in his society burn books, yet Montag has a secret cache of books he’s taken from various fires. When he’s discovered with the contraband, his supervisor gives him one day to read them, to satisfy his curiosity and help him see just how worthless and confusing books are. In Matched, 17 year-old Cassia Reyes has just been assigned her ideal mate. Cassia notes that indiscretions among newly Matched teens are common, as the Officials expect the teens to experiment a bit with other partners before they settle into their assigned marriages at the age of 21. The characters’ curiosity may be expected, but it is not tolerated. Montag’s own wife turns him in for having books in his possession, and Cassia’s Infraction is a kiss, shared with a boy who is not her Match. The people in both societies exist under a Mask of Happiness. The oppressive societies, developed for the comfort of the people, have rules and regulations that eliminate ideas. Without ideas, everyone conforms. With conformity, everyone is equal, and therefore everyone should be happy. The governments in both novels assert that when books and new ideas are available to people, conflict and unhappiness occur. Montag’s fire captain, Beatty, tells Montag that because each person is angered by some kind of literature, it is best to get rid of it all. He described how books were burned first by minorities, each ripping a page or paragraph from this book, then that, until the day came when the books were empty and the minds shut and the libraries closed forever. In Cassia’s world, Selection Committees scaled down the number of books, paintings, and songs in the Society to 100 each. The remainder are forbidden and destroyed. Cassia’s father is a Restoration supervisor whose job is to oversee the incineration of the contents of libraries. In both Fahrenheit 451 and Matched, characters memorize the written word to battle censorship and literally give life to books. Both novels describe societies that are terrifying to imagine, but not as far-fetched as we might believe. But there is hope because these books have been written. As I put the finishing touches on Counteract, I feel humbled to join the ranks. Tracy’s original post can be read here. In need of a new Read? New Releases! In the near future I have two trips planned, one a mini family reunion in the cool mountains, and one with my kids and grandkids at a lake. Both times I’ll bring my little plein air set-up: a folding chair, sun umbrella, paints and brushes, a watercolor tablet and a small folding easel. I’m anticipating feeding my other passion (besides writing and illustrating children’s books). For me, nothing beats exploring nature, with either a two-hour painting, or a quick pencil sketch in the middle of a hike. In my obsession, I coax other people to join me, especially those who say they have no ability. I fully intend to push a paintbrush into the hand of each grandchild old enough to know which is the fuzzy end. 2. Divide your canvas/paper into thirds lengthwise and widthwise, with a big tic-tac-toe. 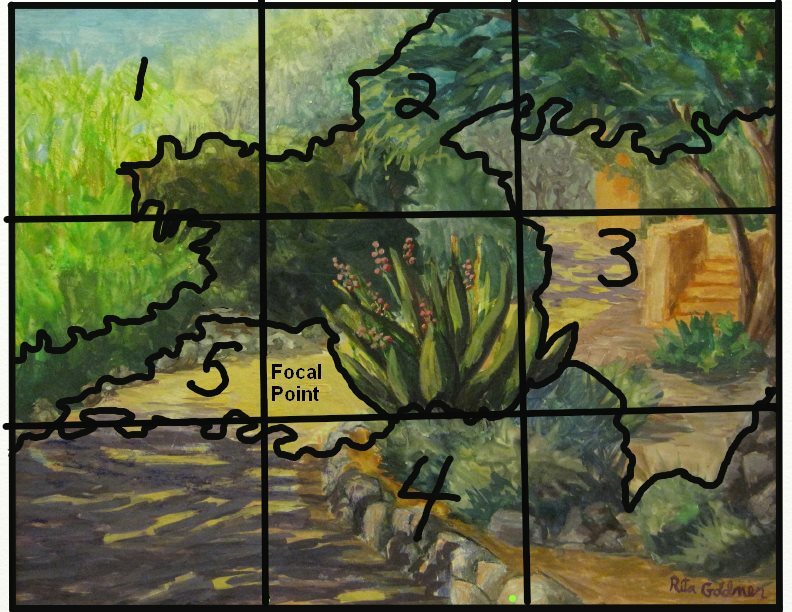 Pick one of the four intersections to put your focal point, and this area will have the darkest darks and the lightest lights next to each other. 4. Make the light/dark patches form a balanced abstract pattern, leading the eye around. 5. Have a limited palette of 3-4 colors, and fill in your big shapes. Later you can break some of them down into smaller shapes, but keep them close in value. Have some hard edges and some soft blended edges. 6. Vary brushstroke size and direction. 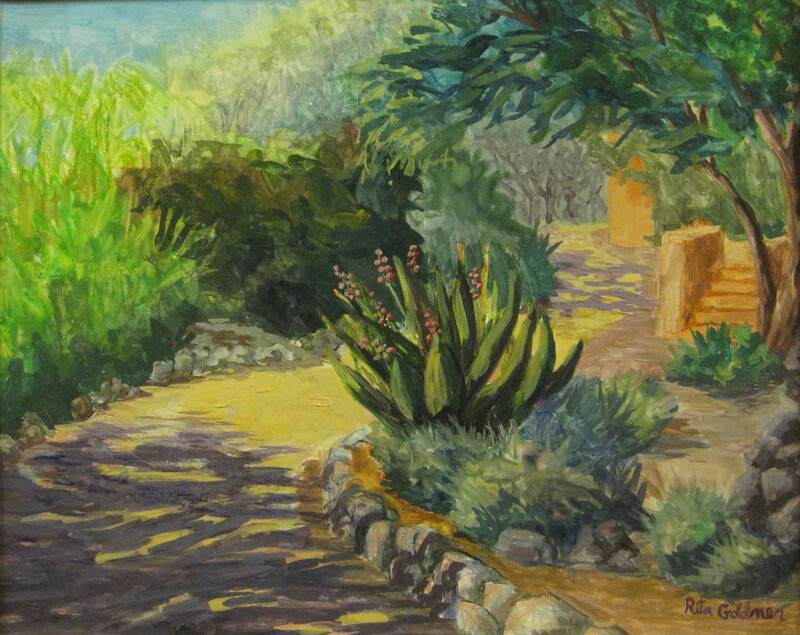 Rita’s blog and website can be found here. In need of a new book? New Releases! Several great books to tell you about coming out soon! Moving on is the hardest thing she’ll ever have to do. Taylor Scott sees the world differently than she did a year ago. She’s no longer the love-sick teenager, quick to smile and full of joy. Now she’s the broken college student just trying to get through the day without letting her feelings overwhelm her. It isn’t until she meets Josh that pieces of herself she’d lost start falling back into place and she can finally see that it’s okay to be happy again. Josh Walker is a professional athlete who has always avoided distractions. His career is just getting started and he works harder than anyone else. Hockey is his life. It’s the only thing that makes sense to him. When a new coach joins the team, it’s his daughter that threatens to complicate everything. He wants to help her. Needs to help her. But when he needs her to do the same, he finds out what she’s really made of. No one ever told him that the hardest part of his hockey career wouldn’t have to do with hockey at all. When news breaks about an attempt to free Brazen, the rogue Alpha, Celeste must rely on unlikely allies, causing her to question the loyalties of everyone around her. With Alek looming continuously in the background and Brazen’s foreboding final words to her, there seems to be no end in sight to the struggle. To top it all off, Roman has always remained by her side, but the discovery of another Wilder family secret may threaten their future forever. Olivia Davenport is looking forward to her future. After all, Prince Liam has pro-fessed his love and King William has promised her a reward for her role on a recent mis-sion. She fully expects to continue her knightly training while enjoying a blossoming ro-mance with her Prince. The King, however, has other ideas, appointing her as a lady-in-waiting to Queen Helen. When, a disturbing prophecy puts the safety of the King in question, fear spreads through kingdom. Intrigue abounds at the palace with an enigmatic witch and a strict Friar at the center of the controversy. Olivia must use her training and instincts to unravel what is truly going on in order to protect the King. Through it all, she questions if she will ever be able to fit into Liam’s lifestyle or if their relationship is not meant to be. Lachlan Smith knows when the world ends. When 12-year-old Locksmith found a portal to a hundred years in the future, he discovered a world where no human had lived for decades. Now Lock and a small group of his family and friends are exploring the ruins of the future to learn its secrets. At the same time, they’re trying to keep those secrets from the world of the present… all while maintaining the semblance of a normal life. The more they find, the more they realize that if they’re going to prevent the end of the world, they can’t do it by themselves. But who can help them? And who can they trust with the portal and the power it represents — the power to reshape the future… or destroy it? For Locksmith, new discoveries, hard choices and dangerous journeys await. Two years ago, Susan Sarnio was brought to the World of Deaths. Fighting sexism and bullying, the first female Death helped reinvent the College. Now, her friends journey deep into the heart of enemy territory, hoping to rescue her. Ancient secrets come to light. The horrifying truth behind Susan’s arrival in the World of Deaths is at last revealed. War erupts between Dragons and Deaths, and the fate of three worlds hangs in the balance. The epic conclusion to The Scythe Wielder’s Secret. I spent seventh grade in a dystopian haze, haunted by thoughts of totalitarian regimes, privations, curtailed personal freedoms, ubiquitous surveillance technology, and nuclear war. Oh, and those awful utilitarian jumpsuits everyone had to wear. Back in the 70s, young adult fiction as we know it did not exist. I read series like Trixie Belden and Sweet Valley High, which meant I was one step off from reading books about bunnies and rainbows. I was twelve, and I was terrified by what I read. I’d never seen a scary movie in my life. I had no frame of reference for the suffering in those books, didn’t connect with the characters, and found it hard to imagine societies and worlds so different from my own. I didn’t see these books as social commentary, as warnings, or as calls to arms. They were English assignments, and dreaded ones at that. Years later, I choose to write in the young adult dystopian genre. Because now I get it, and I can tell an exciting story to share what I think. Frankly, writing YA dystopian fiction…rocks. I’ve been re-reading the classics with great interest, and I’ll be taking a look at old v. new dystopian fiction in future posts. In the mood for a new read? New Releases! Are you a teenager or know a few who love to write? Our Short Story contest is now open. Find out how to enter to win some great prizes. Contest details.